So, only 12% contribute to wealth creation in Scotland! So the leader of the Tory party in Scotland, Ruth Davidson, has claimed that only 12% contribute to wealth creation in Scotland. For starters, I find this an odd thing to say since, as I’ve commented before, wealth creation is a tricky concept but 12% seems like a suspiciously low number. It then turned out that what she meant was 12% pay more tax than they receive in benefits. That also seemed a little odd, so I checked out some of the data and it seems like at least 34% pay more in tax than they receive in benefits (a few other newspaper articles also came up with a figure of 34%). All a little confusing. I now think I know what she doing. She has excluded all public sector workers because they earn more from the public purse than they pay in tax (obviously) and included only private sector workers who pay more in tax than they recieve in benefits (presumably ignoring indirect taxation, which actually makes up about 17% of all tax revenues). It is possible that 12% is the correct figure, but it is a completely ludicrous assertion. It is amazing that the leader of a political party can make such a stupid claim. What is being claimed is essentially that a teacher at a private school who earns the same and pays the same tax as a state school teacher generates wealth, while the state school teacher does not. It is claiming that the police, fire services, doctors, nurses (unless they work for a private healthcare company), council workers, politicians, university employees, and many others do not contribute to our economy. What an insulting and patently ludicrous claim. What it shows is that the leader of a major political party in Scotland does not even have a basic understanding of economics. As I have claimed in the past, wealth creation is not the same as making a profit. A private company can make a profit, while a public service cannot. Both can, however, create wealth. The public sector provides the infrastructure so that the private sector can then sell their products and make their profits. It is, in fact, technically possible to create wealth in an economy that is totally public. The problem with such an economy would be that you would need to reward creativity and innovation and hence some people will earn enough to accumulate wealth. What do they do with this wealth? They can’t invest in the economy, because it is all public. They could lend to the government, but that wouldn’t reward risk taking. You need a private sector so that those with wealth can invest, take risks and provide choice for society (and be suitably rewarded). You could also potentially have fully private economy. The problem I can see with this is that everything will be owned by individuals. Any economic growth therefore goes to these individuals who then accumulate more and more wealth. They could choose to pay high salaries to their employees so as to redistribute this wealth, but why would they do this? Also why would they choose to provide services that all could afford? In a sense a government can act to prevent, through taxation, too much wealth accumulating in too small a fraction of society. Furthermore, there are certainly some services (police, military, fire services, social services, etc) that should be provided publically, rather than privately. I find it incredibly frustrating that a leader of a major political party either doesn’t understand basic economics or does but will make incredibly stupid statements so as to appeal to the base of their politcal party. In either case, I think Ruth Davidson is showing a great deal of ignorance. I thought I would post this link to the debate between Bill O’Reilly and Jon Stewart, which was meant to be in the style of a US presidential debate. Bill O’Reilly is the host of The O’Reilly Factor on Fox News while Jon Stewart is the host of The Daily Show. I used to watch The Daily Show regularly when I lived in the US. It is a fairly left-leaning show but I think it does a fantastically good job of highlighting when politicians and commentators are being disingenuous. It does criticise those on the right more often than those on the left, but does regularly criticise those on the left too. I would argue that this is because those on those on the right are more deserving of such criticism, but others might disagree. I watched all of the debate and thought it was pretty good. Jon Stewart wasn’t quite as slick as he can be on The Daily Show, but presumably the debate wasn’t scripted. I don’t agree with Bill O’Reilly’s views and found them typically simplistic and often selfish (I work hard, deserve what I earn and why should tax pay for something with which I disagree), but I think it is good that he will take part in such events and at least tries to debate the issues. I particularly liked Jon Stewart’s closing remarks. His views, which I think apply to the UK as well as the US, is that we live in a social democracy (whether we like to admit it or not) and should start discussing the realities of such a society, rather than the debate being about rampant capitalism versus rampant socialism, neither of which is a realistic description of the societies in which we live. I think it is worth watching (it’s amusing as well as politically relevant) but it is rather long. Very interesting post. Something similar (but maybe not quite as detailed or quantified) was done in the UK. I believe the results were similar. Those near the bottom felt that there was too much of an income gap but underestimated how much the top earners actually earned. Those near the top of the income distribution, overestimated how much you needed to earn in order to be near the top. Respondents constructed ideal wealth distributions that were far more equitable than even their erroneously low estimates of the actual distribution. 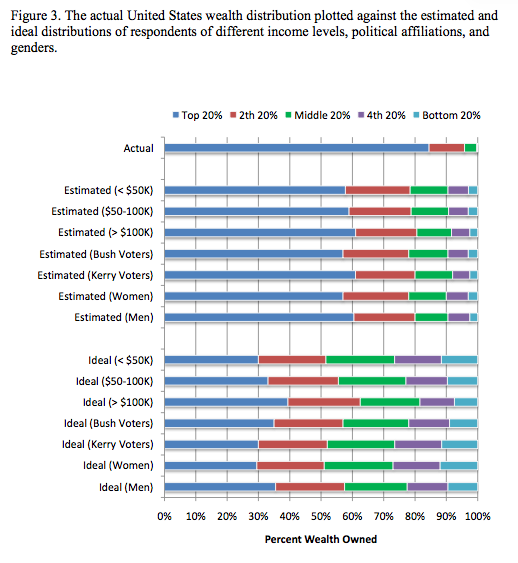 All demographic groups—even those not usually associated with wealth redistribution such as Republicans and the wealthy—desired a more equal distribution of wealth than the status quo. Just recently in a Global Health course, we were shown the breakdown of global income inequality. It’s also pretty ridiculous. In fact, 40% of world’s wealth is owned by 1% of the population. 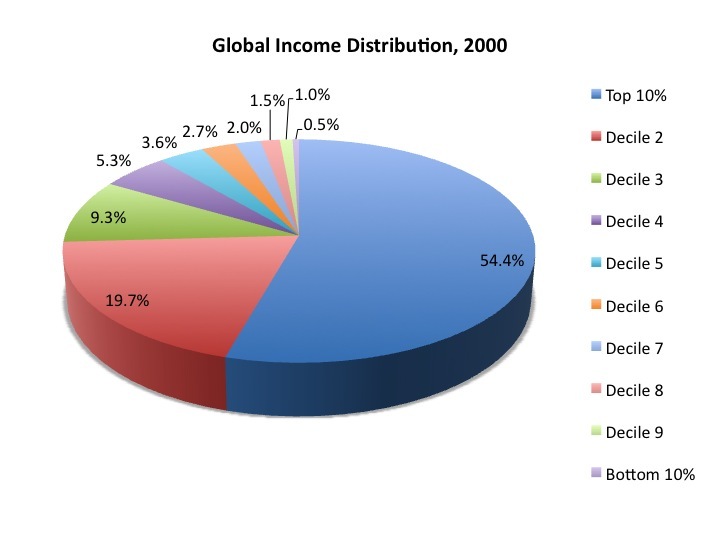 In fact, the richest fifth of the population receives 82.7% of the total world income. I ended up in a debate with someone who was clearly a Libertarian (debate is a rather positive interpretation; it was more like a monologue as I didn’t really get a chance to say much). The basic point that was being made was that government interference (regulation) gives advantages to (for example) the big banks and distorts the market. In some sense there is some merit in this and I certainly feel that governments have been unduly influenced by the banking sector so that the system now benefits the banks (and their investors) rather than society, I’m just not convinced that the solution is to reduce government involvement. The Libertarian view seems to be that if we reduce regulation we will have a level playing field and the markets can reach some kind of equilibrium. In some sense they are probably completely correct; with no external influences the markets would reach some kind of equilibrium, it’s just not clear that the equilibrium would be one that would benefit society as a whole. There is nothing to say that the system couldn’t evolve into one in which a small minority have all the wealth and all (or most) of the income. There’s no guarantee that healthcare will be available to all (look at healthcare in the US). There’s no reason to think the system would evolve to one in which all children could attend a suitable school. The role of government, in my view at least, is to provide some kind of feedback that attempts to shift the equilibrium back to one that is of maximal benefit to society, rather than to one that benefits a minority. It’s my view that governments do need to regulate the markets but should do so in a way that is optimal. Too much regulation is clearly bad, but too little can lead to a system that benefits the few rather than the many. In some sense it seems like it should be constantly evolving. Regulations should be adapted to optimise the markets. If it seems like regulations are hampering growth, reduce the regulation. If it seems like a minority are benefiting at the expense of the rest of society, increase or change the regulations. I just don’t see how you can have no regulations. A similar argument is made by climate change deniers. They argue that the Earth will settle into some kind of equilibrium. Clearly correct but, again, there is no guarantee that the equilibrium will be one in which we can survive. Venus is in equilibrium, but the surface temperature is about 500 K. It seems like these people say something that has an element of truth and then use that to justify their worldview. I don’t know if it is because they really believe it or because they just can’t see the big picture. Probably a combination of the two.